Normally, I don't buy much from MAC collections, unless the packaging is themed. But when I spotted this with 10% off I couldn't resist ordering it. It's from this years Holiday collection and contains a Pro Longwear Paint Pot in Frozen Violet, Fluidline in Blacktrack, In Extreme Dimension mascara, a double ended makeup brush (209/239) and a makeup bag. I'm a big fan of MAC's Paint Pots and the colour of this particular one swayed me into purchasing. It's a beautiful frosty mauve that applies smoothly to the lids. It's quite sheer when swatched, but can be built up to be semi-opaque on the eyes. It can also be used as a base. Frozen Violet is also packed with shimmer, which may not be to everyone's tastes but it's great for a festive eye look. I've only ever tried gel liner once, and I hated it. I found it really difficult to apply and it lacked the staying power and pigmentation that I look for in an eyeliner. Fluidline has completely changed my outlook, however. 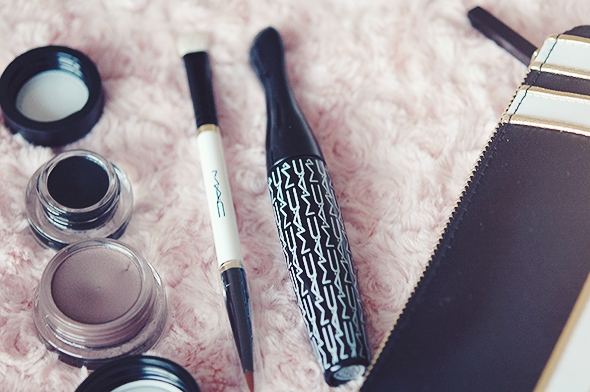 It lasts all day without smudging or fading, and paired with the 209 brush included it's an eyeliner dream. Also included is the In Extreme Dimension Lash mascara. I'm personally not a big mascara obsessive, but this applies clump free and that's a big plus for me. The brush is a bit on the big side, but allows for a bit of volume and lift. I don't think it's a wow-worthy mascara by any means but I will continue to use it. Considering the individual items in the bag retail for more than £50 I think this is a nicely priced set. It would make a great Christmas gift for MAC lovers, or even as a treat to yourself. Great set, love the paint pot! That paint pot is stunning! Love this set good choice! That Paint Pot is a gorgeous color. I don't think I've seen it before.